Tagged "Gears of War 3"
Gears of War 3 ranks in as one of this year’s personal highlights, alongside Deus Ex and Bulletstorm. There are a few plot holes, and in hindsight I don’t think the final boss would have been as impressive without the fancy lighting effects, but it finishes the trilogy off nicely. Would I have liked Gears 3 so much if it was missing the horde mode? Probably not. It’s easy to tell that a significant amount of time has been spent tweaking and balancing the multi-player modes but I have to be in the right mind frame to go head to head with real life players. Being sniped without warning or having some git plant a live grenade on my back is frustrating even if they are key strategies to winning. Horde mode though is something I’m always in the mood for. For the uninformed it’s a co-op mode where you and four others battle waves of enemies. Between waves you get a few seconds to pick up ammo and build fortifications like electric fences and gun turrets. The fortifications are new a addition to the series and fit in perfectly. You can also buy yourself back into the game using cash earned for kills, but this idea hasn’t been implemented that well – you need to save your money for at least five waves to get back into the game on the later levels, which means five waves of not building anything that’ll help your team. Which is what horde boils down to – teamwork. You need to revive one another to survive, and all chip in to get your base up to a decent standard. Another reason I’m so fond of horde mode that there is a slight competitive element to it – at the end of each wave a list is shown, detailing how many kills each player got and how much money they made. Sometimes it’s not the person with the most kills that makes to the top of the list; often it’s those that have assisted with lots of kills and revived people. I never did make it to the 50th wave in Gears of War 2, but I managed it here after several hours of practice. Luck does come into it a lot. If you’re playing with randoms, pray that you have a good set of team mates. I know we all have to start somewhere, but I’ve seen people die on the first wave. You have to proverbially cross your fingers too and hope that nobody quits. The fewer players, the harder it is to make it to the end. Level selection is another factor. Overpass seems to be the easiest, providing the first base is established in the centre of the map. The ruined supermarket map – Checkout – is far too open, allowing enemies to attack from all angles. Thrashball gives you good chances too, although only if the first base is made in the concessions stand, which is a closed off area where it’s easy to defend yourself and you can blast away the enemies as they come marching up the stairs. A good survival tip is to stick grenades onto things. Specifically, the areas were the enemies spawn from. The worst case scenario is that it’ll be wasted on a ticker. The best case? I managed to kill three Screamers with one cleverly placed explosive. Sticking grenades onto decoys is a good way to bag an easy kill too. Another tip is to remember where the larger enemies die – Boomers will drop boomshots, ready for the taking when you get a moment spare. Usually when there are only one or two enemies left I go searching for ammo, so that I can use the precious time between waves to repair the base. Incidentally, to be able to build sentry turrets you need to keep building decoys and not turrets as some may expect. Myself included, there. 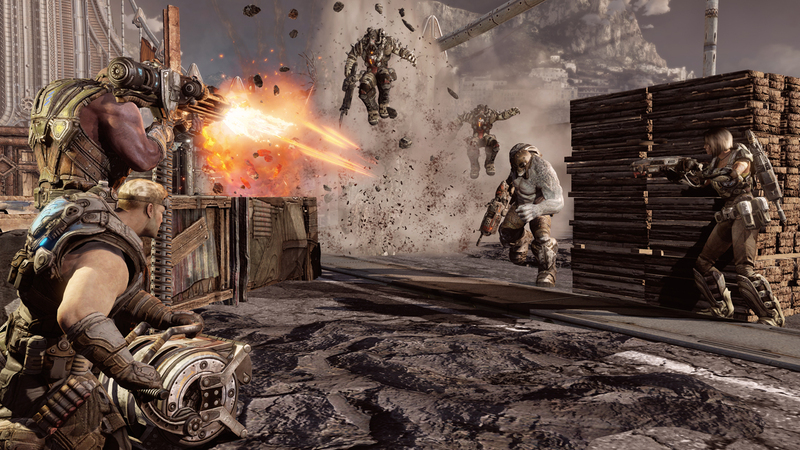 The first piece of DLC for Gears 3 is going to be for the horde mode offering new maps and such. More importantly though, some extra achievements to unlock worth a total of 150G. 800 Microsoft Points have been hoarded away on my Xbox account well in advance. Predictably, FIFA 12 has pushed Gears of War 3 off the top of the UK chart this week. It has become the third biggest UK launch ever, with launch sales up 18% over FIFA 11. You may recall that we were mildly interested in seeing how well the PlayStation 2 version performed, considering that you can count this year’s PS2 releases on three fingers. A glance at the individual chart reveals that it made #25, outselling the PC version at #27 and the 3DS version at #30. PC download sales aren’t included, mind you. FIFA 12 sold the most on Xbox 360, followed by PS3, Wii and PSP in that order. The recent PlayStation 3 HD collections haven’t fared brilliantly – God of War HD Collection Vol 2 has left the top 40 after just two weeks – but Ico and The Shadow of the Colossus Collection has managed to make the top ten, clocking in at #7. Activision’s scrappy X-Men Destiny arrives at #18, while the arrival of Child of Eden on PS3 helps it to re-enter at #29. In the DS chart, Aliens Infestation crawls in at #30. Other new entries Rune Factory 3: A Fantasy Harvest Moon and Harvest Moon: Grand Bazaar both outsold it at #19 and #25 respectively. It pains us to say it, but there are developers out there who simply take on projects that are destined to be dire to save having to turf their staff out onto the streets. A fine example are studios signed up to make movie tie-ins on incredibly short deadlines, or asked to make a budget game for peanuts. Then there are studios dedicated to bringing the world the most polished products they can, pushing both the host console and their own technology behind it. Companies like Epic. And we should be thankful they exist. 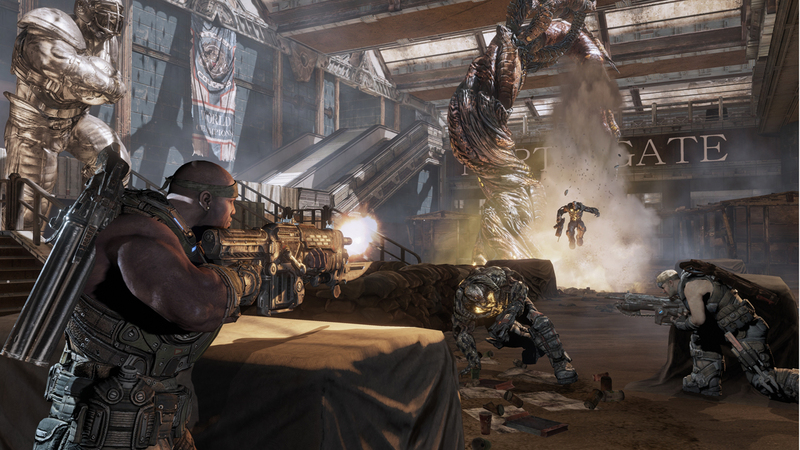 To the untrained eye, Gears of War 3’s campaign mode is more of the same. Battle hardened Gears fans though will quickly notice all manner of improvements like tweaked animation, improved lighting effects and an increased level of detail. Wondering what the Xbox 360 looks like running at full pelt? This probably isn’t far off. Taking a leaf out of Bulletstorm’s book there’s a score-based arcade mode too, while environments are more sun-soaked than war-torn including a sandy beach and insides of a fancy hotel. 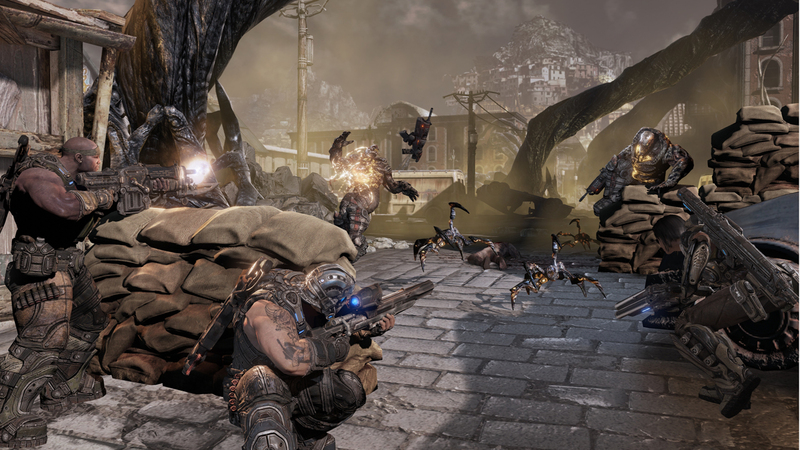 The story rounds off the trilogy, with Marcus Fenix trying to track down his father and carry out his plan to rid the world of both the Locusts and the Lambent. Marcus is joined by his wisecracking stereotypical soldiers throughout, with an early mission filling in the back-story of former sporting legend Cole Train. It’s a fitting conclusion to the trilogy, with a highlight being a Lord of the Rings-style siege set inside a fortress. There are however a couple of low points that stop it being constantly brilliant – having to search around a dull naval dockyard for spare parts is as exciting as it sounds. The next mission after this does go a long way to making up for it though, being both rather unexpected and a treat for the eyes. Weapons too have been tinkered with. The Hammerburst has been given a Call of Duty-style iron sight making it one of the most accurate weapons available. There’s also the Vulcan cannon – a weapon so powerful it takes two to carry, with one player holding the cannon while the other follows behind carrying the ammo supply, which has to be fed in by rapidly tapping the A button. The only weapon that feels unbalanced is the One Shot. It’s certainly handy – as the name suggests, it’s able to take down an enemy with one hit – but it feels far too overpowered compared to other weapons. Of course, there are new enemies to use these weapons on. The drudge can mutate into different forms, the armoured Kantus has to be destroyed with explosives while a centipede-alike adversary only has one weak spot – the tail. Then there are the wild Tickers – parasitic pests that eat any weapons or ammo left laying around unless you put the boot in. The whole of the Locust army and their extended cousins are back as well, including the slightly over-familiar Grinders, Boomers and Wretches. When Epic first told the world about the new Beast mode, they explained that you’d start off as a Ticker and then come back as a bigger and stronger enemy every time you got a kill. Fortunately this has been changed before release – although you can start off as a Ticker there other Locust soldiers available from the start. Rather than simply being Horde mode from the other perspective, it’s an against the clock affair where you have to kill 12 waves of AI controlled COG soldiers. Health doesn’t regenerate (although the Kantus guards can heal) and most of the Locust can’t use the covering system either. A lack of challenge prevents it from having a great deal of depth – pick a Boomer and you’re guaranteed to get one kill at the very least – but it can be pleasingly chaotic. Out of all the mutliplayer modes it’s Horde mode that has had the biggest overhaul. There’s more depth here than even in the campaign mode, thanks to a new XP system and the ability to build bases complete with electric fences and decoys to fool the enemy. It wasn’t until five hours of play that we had levelled up enough to place sentry turrets. Kills earn cash, not only used to build the aforementioned, but also to buy yourself back into the game. There’s a bigger variety of levels, including a shopping mall and a dry dock, while the waves now have bonus challenges and bosses. In team deathmatch AI now fills in when people drop out and wingman (which sees three teams of two battle it out) remains as competitive as ever. If you don’t use a headset while playing this mode then you aren’t going to get very far at all. Gridlock, one of the classic maps from Gears of War 2, makes a reappearance in a redesigned fashion. 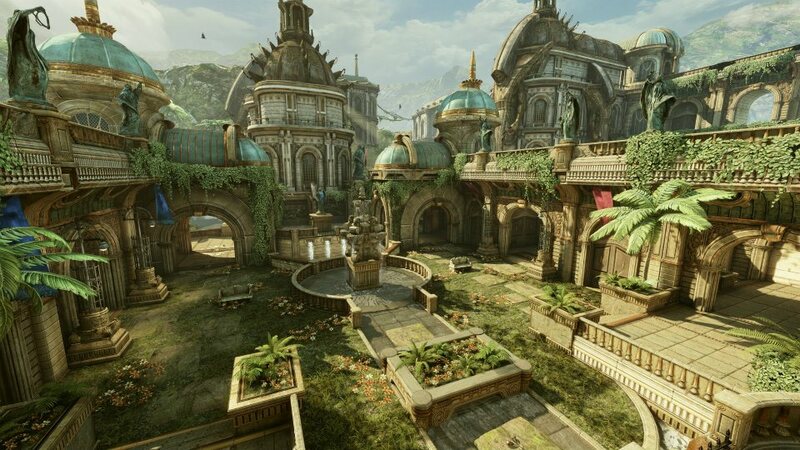 If you’re a serious Gears of War fan then you will have no doubt had some legendary battles on this map in the past. Gears of War 3 does plenty of things well, but rewarding the player is something it does exceptionally. As soon as you start your HDD is ransacked to see how far you got in the previous Gears of War games and you’re consequently rewarded with extra weapon skins. There are 32 different characters to unlock in total, in addition to ribbons and medals to earn for completing such tasks as swiftly killing multiple enemies in a row to being the last man standing. A journal keeps track of your progress, so you can see how far you’re off unlocking new characters or shiny medals to show off online. The difference between GoW 2 and GoW 3 is comparable to the jump between Halo 2 and Halo 3 – there’s a sense of familiarity with the single player mode but multiplayer has been heavily improved. The fact that Halo 2 and Halo 3 were on different consoles simply further highlights Epic’s finesse. There’s no prize for guessing what game is at the top of the UK chart this week. You may not have guessed though that Gears of War 3 ranks as the biggest launch of this year so far, almost beating the launch week figures for Gears 1 and 2 combined. Codemasters’ F1 2011 makes a pit-stop at #2, followed by Dead Island, Zumba Fitness and Deus Ex: Human Revolution. 505 Games is, in fact, the only publisher to have two games in the top 10 this week, with the other being Rugby World Cup 2011 at #10. 505 Games’ MMA Supremacy isn’t off to a good start, however – it’s at #24 in the PlayStation 3 chart and #29 in the Xbox 360 chart. As for other recent releases, Rise of Nightmares drops from #18 to #25, Starfox 64 3D goes from #13 to #35 while God of War Collection Volume II drops from #35 to #38. We’ve brought this week’s new release round up forward a couple of days as this week’s biggest release – Gears of War 3 – is being released today. A Tuesday, of all days. Reviews hit the ‘net late last week. The Official US Xbox magazine gave it a perfect score of 10/10 while the Official UK Xbox magazine awarded it 9/10. Away from the dubious official publications, IGN went with 9.1 while GameInformer a 9.5. Eurogamer and Destructoid weren’t quite as impressed, each giving it an 8. It’s these two reviews in particular that ruffled Cliff Bleszinski’s feathers calling Eurogamer “haters”. If you’re the design director of a company and expecting your game to get 9s and 10s then you’re not really leaving yourself open to any constructive criticism, are you? EA MMA didn’t do too well when it was released last year, despite being a lot more accessible than UFC: Undisputed, so it’ll be interesting to see how 505 Games’ Supremacy MMA does. A version for the PSVita is due out at some point too. It’ll probably be a launch game unless they’re making it from scratch for the handheld. Similarly, F1 2011 hits PlayStation 3, Xbox 360 and PC this week with a PSVita version due later. A 3DS version is also in the works, unless it has been silently canned. The Metacritic stands at 86, with most reviewers claiming Codemasters have addressed a lot of problems from the previous F1 and have given the multi-player mode some much needed attention. GamesRadar gave it 90. And what do Wii owners have to look forward to? We Wish You a Merry Christmas. “The Perfect Stocking Stuffer!” reads the blurb, but who exactly has their stockings out in September? Next week: FIFA 12 (PS3, PS2, 360, Wii, PC, PSP, 3DS), Child of Eden (PS3), Ico & Shadow of the Colossus (PS3), X-Men Destiny (PS3, 360, Wii, DS), Cooking Mama World: Outdoor Adventures (DS), Rune Factory: A Fantasy Harvest Moon (DS), Anglers Club Ultimate Bass Fishing (3DS), Atelier Totori: The Alchemist of Arland 2 (PS3), Ben 10 Triple Pack (DS) and the apparently very good Aliens: Infestation (DS). And so the official name for Natal is now Wave. Actually, that’s a lie – it’s now Kinect, a word that Microsoft Word’s spellchecker really doesn’t like. So, the rumours of it being renamed as Wave turned out to be false. That said, it might have gone under the moniker of Wave behind the scenes at Microsoft over the past few weeks – Eurogamer claims that Microsoft only trademarked the word Kinect in the past month. The motion sensing camera is due out worldwide this winter, starting in North America on November 4th. 15 games are promised at launch, all of which involve waving your arms around like a loony. Kokatu says that the 360-exclusive Star Wars game that was shown looked the most impressive. Eurogamer seemed to reckon that it’s an on-rails affair though. Rare are behind Kinect Sports, which includes soccer, bowling, javelin, long jump, table tennis, boxing and beach volleyball. They’re also responsible for Kinect Adventures, which includes the water rapids game that a few people let slip about. The camera takes photos of you as you play, so make sure you do your make up before playing. On the dashboard you’ll be able to access the The Kinect Hub where you can use the camera to interact with Facebook, Netflix and Zune. 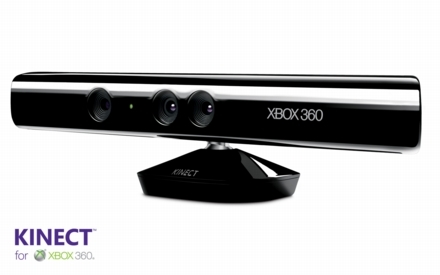 MCV reckons that Kinect games will retail for £29.99 – the same price as most Wii titles. The elusive RRP for Kinect remains a mystery for now, although Game are letting gamers pre-order it already. As for third party Kinect stuff, Ubisoft are reading Motion Sports and Your Shape: Fitness Evolved, THQ will release The Biggest Loser, Blackbean has Get Fit (featuring Spice Girl Mel B), Konami are offering Adrenalin Misfits and Dance Masters while MTV/Harmonix have Dance Central in the pipeline. Here, you have to copy dance moves as they appear on screen – they’ve worked with world class choreographers to bring 600 moves and 90 routines. Some Disney games were also promised but all that was shown as a CGI Tinkerbell. Joy. The Kinect line-up isn’t just kid’s stuff and games for fitness buffs – Forza Kinect and Joy Ride are two very different racing games for Micosoft’s new toy. Joy Ride was first announced a whole year ago as a free-to-play Xbox Live game. It’s not clear if this is still the case. Metal Gear Solid Rising will support Kinect too while Sega announced Sonic Free Riders. Now back to the games that require those old fashioned joypads. Fable 3, now with added Jonathan Ross, has a release date of 26th October while Halo: Reach will be available from 14th September. There’s a new video here. Gears of War 3 is shaping up nicely – as well as a few new characters, including female Anya, there’s also a four-player cooperative campaign and the new Beast mode. It’s due in the US on 5th April 2011 and Europe on 8th April. The new name for Natal wasn’t the only surprise. 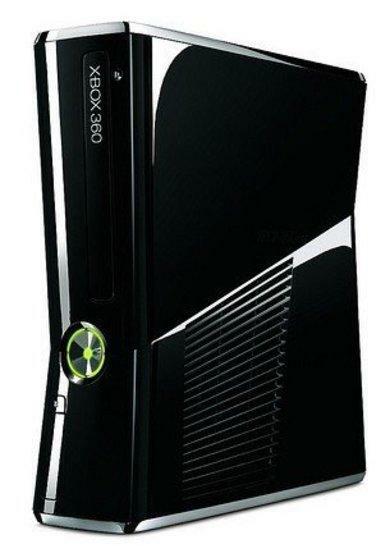 Not by a long shot – Microsoft have “done an Apple” and announced that a new sleeker version of the Xbox 360 will be shipping to US retailers from today. It’s “whisper quiet”, has a 250GB HDD and “the fastest wireless network for any console”. The cost? Same as the plain old noisy Xbox 360 – $299. It’s out in PAL-land on 16th July. It reminds me of one of those Alienware PCs. In the world of downloads, namely Xbox Live Arcade, two mention-worthy games were confirmed – the 2D Castlevania: Harmony of Despair and Hydro Thunder Hurricane, which will have an 8-player online mode. Plenty of new games, then. But perhaps a few too many evolving getting fit. I’d also wager that most of the third-party games shown for Kinect will also be appearing in Sony’s E3 round-up tomorrow. And maybe even in Nintendo’s conference too.